CesarCar: "The mobile app makes it possible to control the automobile security system remotely and possesses all the functionality of a regular alarm system key fob. The user can trace the automobile on the map ..."
We've a team of Broad Experience in iOS SDK, key iOS Frameworks, Objective C & Swift Programming. We design & develop future ready awesome iPhone applications. We've developed 75+ iPhone Apps so far. "The guys at Algoworks are very professional in all their engagements and we have been very happy with their performance. They have a very good team of developers who are experts in what they..."
Flick Pic - 4 Pics 1 Word: "Flick Pic - 4 Pics 1 Word is a word guessing game." "I wish the Hypersense team every success going forward, I think they’re a phenomenal team. I think that anyone who’s considering building applications or solutions should consider them 1..."
"A strong team of developers and highly recommend working with." Specialized in building iPhone apps with support of latest hardware features coupled with most recent iOS version. "IndiaNIC were always honest and communicative and they volunteered useful feedback. They were available at all times when we needed them and they've helped us improve the product and create ..."
IAT has a great team of iPhone app developers which stay up-to-date with the latest SDK editions and newly launched iOS devices. To develop your iOS application for any iPhone edition will be a pleasure for us. The most important aspect while developing an iPhone app is to make sure that the team developing it knows and understands, development in iOS to perfection, at Apponward Technologies, we do. "I was seeking a company that understood mobile app development and someone who could very quickly convert a client server app into a web / mobile application. Simform provided a quality dev..."
Dotsquares Google Assistant: "To get information about Dotsquares and request an estimation"
"They're just unbelievably responsive when working to find the solution, and very customer-friendly. If I didn’t have Appiqo, I would have had to source three types of different companies t..."
We have a stellar reputation as iPhone app developers. Our apps are custom built for iPhone. "I have been working with Softuvo and it's dev team for almost a decade now. The team is extremely competent and has a great "get it done" attitude. I am and will continue to use their servic..."
"Umbrella have consistently worked to my high standards and delivered good quality work. They are a long-term partner of ours and have made a significant difference in helping to build our li..."
"The staff at Scramble is knowledgeable and cares about the projects they work on. The team has a good track record of creating quality and timely code for our operations. Thier XMPP expertis..."
"Whether you are a startup or a large enterprise, it would be wise to speak to MobiDev about what they could do for your company. Their mission goes well beyond excellent software development..."
At SemiDot, top iOS app development company, our iOS app developers, with their expert coding, provide us with the best of the class ios apps, keeping the quality standards at their best. "Ido has been a very responsive, strategically minded, and knowledgeable partner in the year we've worked together. He is a well-rounded project manager with significant experience working wi..."
Video Fan & Artist App: "Boom Fan App - Fans can view videos and uploads of their favorite artists"
"A very professional team to work with. They did deliver the project on time. I would recommend this team." "I needed a web developer to make my business an internal management software and an app to monitor my crews. I found this company after reading one of their blogs while searching on google. ..."
"Appus is highly professional and always tries to do the best work possible. They are honest and trustworthy and make good suggestions to achieve the agreed upon goals." OctoPull: "Octopull is a iOS & Android mobile app built to develop team coordination. The app employs a gesture based UI, creating a top notch user experience. The app gives users the option to create challenges..."
"I highly recommend Innofied. We expanded the project several times, and that's part of the explanation of why we weren't on budget. But Innofied is a very capable company that does phe..."
"They are the Best in Business!" "Mobiloitte I cannot express how happy I am with Mobiloitte and the service they provided me throughout this entire process. Being a college student, I wanted a way to make money as a par..."
EitBiz has an expert team of iPhone app developers which stay up-to-date with the latest SDK editions and newly launched iOS gadgets. "The Mendios Technologies Event App was a great introduction to the event and supplemented the event footprint, improved visitor / delegate engatement and was a progressive step for the marke..."
"Spinney is an excellent technology company to have as a partner. They were able to meet all of our technical challenges with ease and took great interest in making sure that our business nee..."
"I could not have hired a better team than CodeCenture. Their prompt communication and attention to detail made my app a success not only technically but on the market level as well. After ..."
The iPhone is a smartphone created by Apple that uses Apple's iOS operating system. The first iPhone was sold in 2007 and since then, there is a new model released every year, or even more often. iPhones can increase their functionalities by downloading apps from the App Store. The Apple’s App Store has more than 2,200,000 apps available. The first iPhone was a GSM phone. With the iPhone 3, the 3G arrived. iPhone 4 brought the virtual assistant, Siri. The iPhone 5 started the Lightning connector trend, while iPhone 7 brought water resistance. iPhone 8 introduced camera improvements and wireless charging, but the newest iPhone X was deemed as groundbreaking thanks to the Face ID (face recognition feature), and a lens that helps take better pictures in low light conditions. In short, we could say that iPhone quickly turned into a true game-changer within the mobile world and helped Apple become one of the main tech leaders. iPhone is probably the most popular smartphone worldwide, and iPhone users are incredibly loyal to new updates and very used to trying new apps available on the App Store. Following the launch of the iPhone X, iPhone sold more than 77M iPhones devices during the first quarter of 2018. Although the market share is smaller than Android’s (Apple has about 12%), iPhone users have a higher financial status and hence are more likely to install paid apps and make in-app purchases. According to the opinion of our iPhone developers, iPhone apps are easier to develop because there are not so many devices available and the restrictions are clear. For this reason, it’s also easier to predict errors in the development process and there are fewer lines to code. However, as apps for iPhone are known for their high quality, Apple’s validation of mobile apps on the App Store is usually strict and thorough, which means that the process is more difficult than, for example, in Google’s Play Store. The iPhone app developers directory is the place to find the best iPhone app development companies, with a review system that involves manual and thorough validation by someone in the AppFutura team. In addition, with the AppFutura escrow system, you can easily manage your next iPhone project in a safe way. 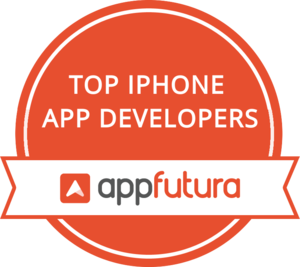 Remember that you can contact the top iPhone app developers by sending them a message through the AppFutura contact system or simply by visiting their website or making a call. On the other hand, if you have a clear idea of what kind of iPhone app you want to create, feel free to post an iPhone app project and get proposals from great iPhone development companies.